This tutorial video gives you a basic approach for naming alkenes which are molecules containing pi bonds. I approach this topic using my ‘puzzle piece’ approach to naming organic compounds. Included in this video are an alkene introduction including concept and calculation of hydrogen deficiency, followed by the rules and examples of naming simple alkenes, substituted alkenes, cyclic alkenes, and dienes. 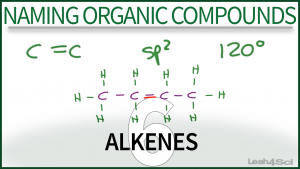 This is Video 6 in the Naming Organic Compounds Video Series. Click HERE for the entire series. A million thanks yous! Your videos are saving my life!! It’s a pitty that you didn’t use the new IUPAC names for alkenes ( e.q. hex-2-ene) e.t.c. Otherwhise I could use these movies for my students. Loved your way of Teaching..